What does it look like when we become the victim? You sigh a lot – either internally or physically. Another tragedy? Oh well, figures. The world is out to get me and I’m so tired of it. It becomes increasingly easy to see things from a negative point of view. And not just negative in general, but negatively impacting you. In fact, when you encounter a new piece of information or snippet of news, the first thing you think of is: how is this going to crush me further? It becomes hard to sympathise with anyone else. The idea of wiggling into someone else’s shoes, particularly if they’ve added to your burden in any way, seems incomprehensible. Your loved one’s illness is a personal affront to you. How dare it make your life worse? Why is it wrong to believe yourself to be the victim? Our enjoyment of leisure activities and ‘small pleasures’ is reduced because we are certain they will not last, or make us happy, and we are too busy looking into ourselves to look at the One who will. When we see ourselves as a Victim, we see ourselves as innocent. A Victim is undeserving of their situation. In any specific circumstance this may very well be true – but it does not make you a saint. We are ‘true victims’ a lot less often than we suppose. Victimising removes choice. “I can’t help it, I’m the Victim.” Yet we always have a choice. In the our most helpless situation, we have a choice what thoughts will go through our minds and how we will respond. What can we do to stop seeing ourselves as the victim? Remember that often we slip in and out of seeing ourselves as a victim. What sort of situations makes you disgruntled and begin your ‘woe is me!’ sighs? Once you know them, you know when to start praying! Most of all turn to Jesus. If we remind ourselves constantly of the hope we have in Him, it’s much harder to fall into disappointment. When we know His power is working for us, we are less likely to feel helpless and vulnerable. Often seeing ourselves as a Victim is a way of making sense of tragedy and regaining a sense of control. 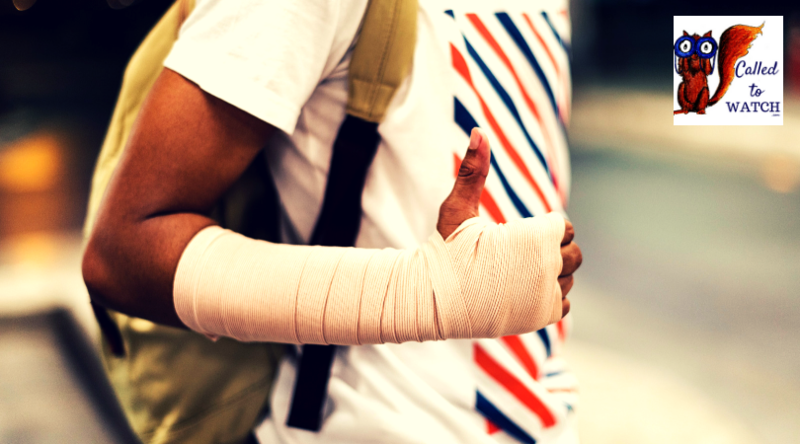 Perhaps the easiest way to avoid this is to realise that while we may not be able to coordinate our circumstances, God can. It is only when we trust in Jesus that we are really in control, because it is only with His help that we are truly able to choose not to be a Victim. Don’t want to be a victim? 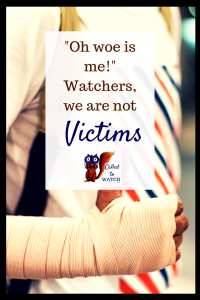 And so next time you feel tempted to sigh heavily and catalogue a list of your current woes, remember my friends – we are Watchers, not Victims! // Do you find it easy to slip into believing you are the Victim? How does this affect your relationships? Read the rest of the series! Watchers we are not… delegates, impartial observers, saints, biographers or doctors.